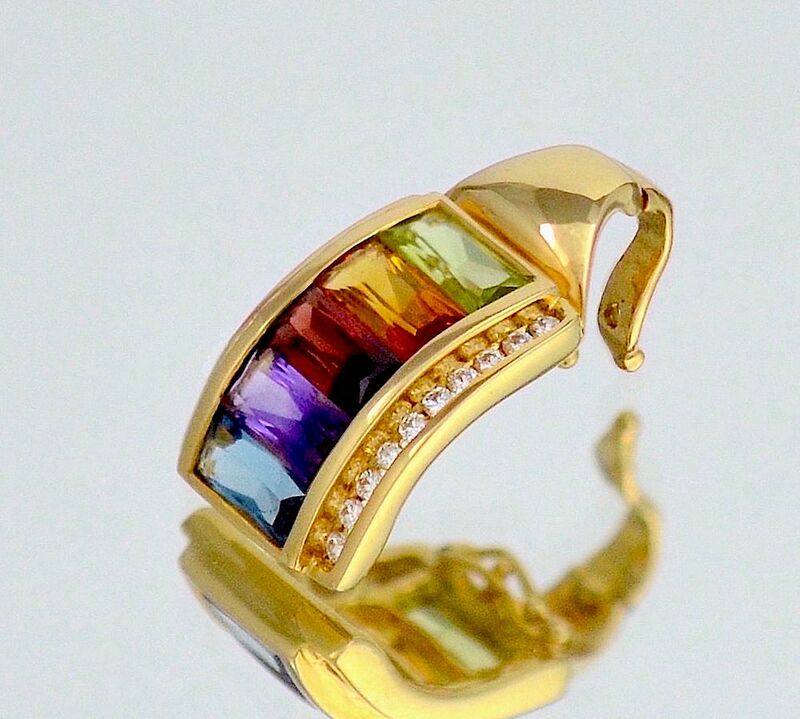 This lovely 18ct yellow gold curved pendant is invisibly set with 6 rectangular gemstones, being & starting from the top, green tourmaline, citrine, garnet, amethyst & topaz. The edges of the pendant are channel set with round diamonds. The pendant is fitted with an enhancer clip to enable it to be worn on a thicker chain or on pearls. It hangs on an 18ct yellow gold chain. Marked "750" for 18ct gold & with a mark that I have not been able to verify as being used by H Stern. However I believe that the pendant is also part of the "Rainbow Collection" made by the Brazilian jewellers H Stern as the quality of the manufacture and the stones, the cut of the stones and colour match and the design are all identical to the H Stern earrings that are also on the site.